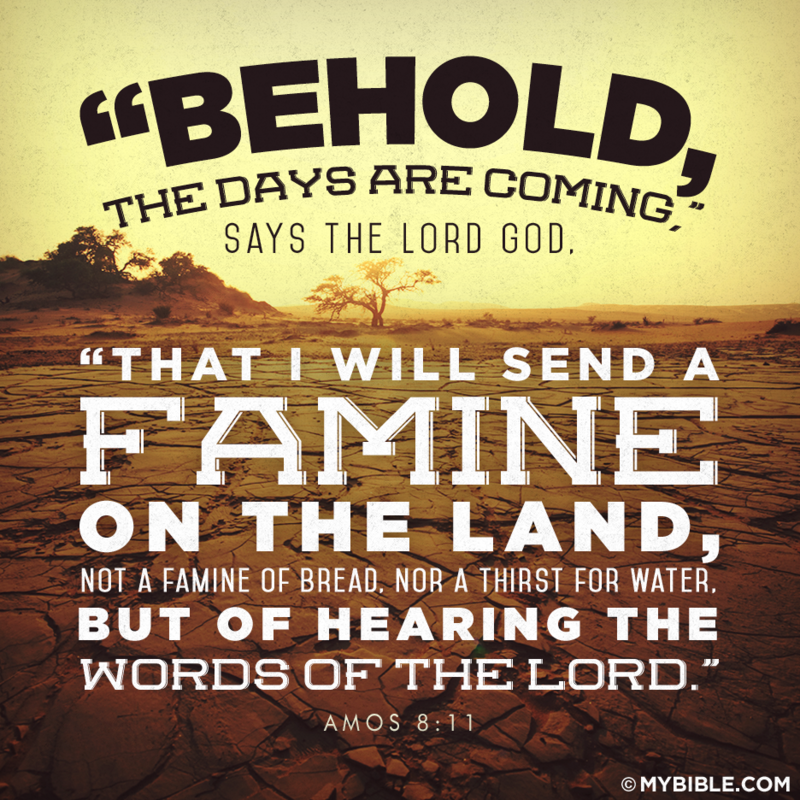 (Amos 8:11) 11 “Behold, the days are coming,” says the Lord God, “That I will send a famine on the land, not a famine of bread, nor a thirst for water, but of hearing the words of the Lord. In our last time together we discussed the difficult days of being in a famine of hearing the word of the LORD. The prophet Amos’ declaration was first spoken to the nation of Israel and from it we were able to surmise, the reasons for the prophesied famine. Not trusting in the LORD, Judah made alliance with the pagan northern kingdom of Israel; Samaria being its capitol city (Amos 6:1). This led to great financial prosperity, where they lived for comfort and recreation (Amos 6:4-7). In this environment, they became insensitive to God’s word [His anointed illuminated direction and prophetic pronouncement and correction], as well as the afflictions of the needy around them (Amos 6:7). In their prosperity they became prideful and thought they were self-sufficient (Amos 6:1). Ultimately they no longer received the word of God as it was in truth: to effectively work in them that believe (I Thessalonians 2:13). Therefore, rather than hearing the Holy Spirit illuminate them to God’s will, way and direction, they merely treated the word of God as one more accessory, that proved to them (in their carnal attitude) that they were blessed by God. O how wrong they were. It is probably superfluous to say, that multitudes of Christians in America are in grave danger of having a famine of hearing the word of the LORD. Despite having God’s written word available to anyone who wants it, we also live in the most “prosperous” nation since probably Sodom or Israel. How’d that turn out for them? (Ezekiel 16:48-50) 48 “As I live,” says the Lord God, “neither your sister Sodom nor her daughters have done as you and your daughters have done. 49 Look, this was the iniquity of your sister Sodom: She and her daughter had pride, fullness of food, and abundance of idleness; neither did she strengthen the hand of the poor and needy. 50 And they were haughty and committed abomination before Me; therefore I took them away as I saw fit. In the “prosperity” of America, we can become insensitive, apathetic, lack proper godly sobriety, and live as though we are better off than Christians around the world, who have far less access to the word of God. In the relative freedom and day to day peace we live in, the above attitude prevails easily, yet when suffering arises we see the paper thin veneer of it. How do we guard against the potential of holding the precious blessing of God’s word, improperly? How do we avoid being affected by the potential of a famine of hearing the word of the LORD? (Psalms 119:103-105) 103 How sweet are Your words to my taste, sweeter than honey to my mouth! 104 Through Your precepts I get understanding; Therefore I hate every false way. 105 Your word is a lamp to my feet and a light to my path. In this verse there are three elements key to our receiving the word of God as it is in truth. God’s word must be our only source of illumination, comfort, and confidence. In dealing with illumination this is more than understanding, which means we grasp a meaning. Illumination comes from the Holy Spirit, as He reveals how the understanding defines, fits into, and ought to be carried out in our circumstances. This is not us intellectually and analytically figuring out methods or plans. Illumination means the Spirit of God leads, commands, and opens revelation as to what is coming, which apart from Him we would not know. Illumination leads to comfort in the dark valley of the shadow of death; which is the pathway the narrow road to LIFE runs through. To the person sold out to Jesus, every day has the potential to bring contrary, even threatening circumstances and mountain like problems. These can seem to darken even the brightest day and pull our minds into the pit of despair. Yet in that darkness, you hear it… the voice of the LORD! It is the word of God, whether opened to a page, or brought to memory by the Holy Spirit. A torch in the dark, that lights the next step… Awe yes, His word brings COMFORT. Note that this comfort is not the next ten steps but A STEP! This is instructive for He gives us enough light to obey one step at a time. I believe this is because ABBA knows, we can only handle one step at a time. This does not bode well for those who desire to get out of trouble instantly, but for those who desire to persevere in Christ, each new step illuminated gives us confidence that the darkness will not overcome us. Each new step also gives us confidence that He is with us and will continue with us, until we get to a place of rest. Practically speaking, this is a difficult truth to put into practice for people who have been trained to search for pain relief at first sight — to seek a solution when the uncomfortable arises — to pray for new circumstances when the ones we are in, are not within our particular preference. Difficult as it may be, this is one of the purposes of hearing the voice of the LORD. Let me ask you, what was the last illuminated word you had heard from the LORD? If you are in the dark, obey His last command that seems unrelated to your current circumstances. You may find the comfort you need to endure for His glory. This entry was posted in Amos 8:11-12, famine of the word of the LORD, Living Word of God, Psalm 119:103-105, Psalm 1:1-3, the voice of God, The Word of God, Uncategorized, Word of God. Bookmark the permalink.